Congratulations to Ashley Mercomes ! It is a great to work with both of you ! And thanks for your testimony about Bamboo Bakery service ! Our economy as of now is at a stance, we need to learn on ways to save! 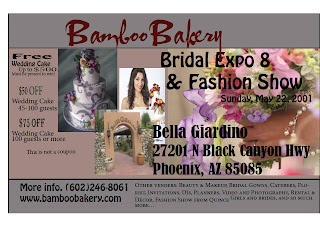 Bamboo Bakery is here is help; we want our customers to save their money at the same time getting their moneys’ worth. We are all about quality, and if we can help you save we will. There are plenty ways that you can save with us, it’s simple. Saving is everything, and our Bakery wants our loyal customers to save in any way that they possibly can. Our cakes will exceed all expectations and our pricing will be unbelievable. The first response that customers would tell us about our discount rates would be who would order that far in advance. The list of wedding cakes is ridiculous. There are lots of people that do order that far in advance. So when you know that you need a cake, it wouldn’t hurt to give a call earlier that usual because we are here. The discounts are always going to be here for anyone to take advantage of. So if you need a cake, give us a call and put in your order as soon as possible. Another way that you can save and save even more is by attending our shows. Just by coming out and supporting us, we will discount you on that. So, if you need a wedding cake, or anniversary cake, and or a quince cake, and or big cake, come. Our next shows would be on May 22, 2011, August 21, 2011, and all the other events would be listed on our website, www. Bamboobakery.com. Admission is free. At these bridal shows we offer free cake testing, and we provide many varieties of cake flavors and fillings. We want everyone to try our cake, and just see the quality and heart that we put into our cakes, just to show that we are the bakery that you are looking for. These rates are there just by attending. On top of that there will be a lucky person that would receive $500 dollars off their wedding cake, but this present would have to be present at the time that his or her name is called, just to be fair. Look at all the ways so far that you can save. One is by ordering in advance and the other is by coming out and supporting at our bridal expos that we host. Although, we are not done yet; the other way that you can save with us is by giving us your email. Usually, we have a form at the bakery for you to put your name and email address on. Although, we want to make it a little easier you can just email us your email address at Orders@bamboobakery.com. Just by being part of our fan mail, we will personally send special discounts and offers to you. 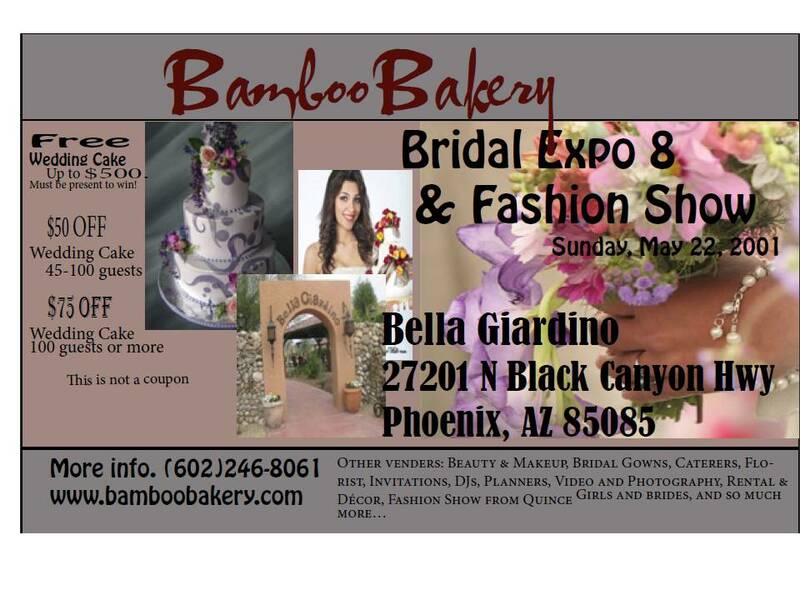 Also, for our fellow fan on Face book : http://www.facebook.com/video/video.php?v=221797547835416&saved#!/pages/Bamboo-Bakery/199195579107 , we will post our discounts and offers on there to. There are lots you can do for discounts on cake, feel free to take advantage of it. Our cakes will exceed all expectations. You have many opportunities to try our cakes, at the bridal expo shows, or even at events that we are apart of to check out the quality of our cakes. That being said, we have over 150 different favors and fillings to choose from. Come in or give us a call and put in your orders, discounts are waiting to be used and take advantage of.